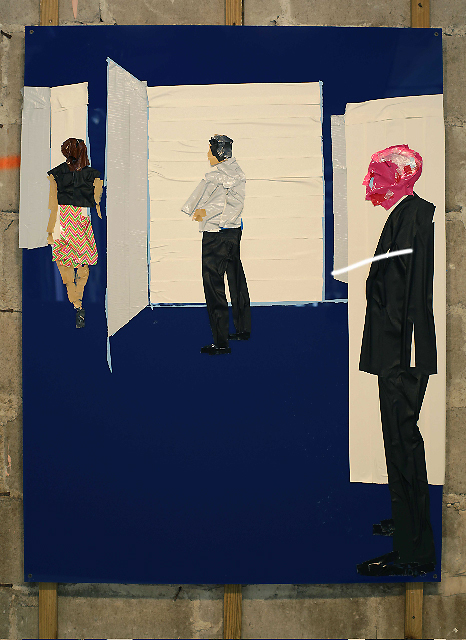 The mixing of low-end, industrial materials, like duct and packing tape, and the high-end art market is familiar. Artists like Thomas Hirshhorn and Maurizio Cattelan utilize it in their works. In fact, Hirshhorn's taped installations have been featured in art fairs. Duct tape typically appears as an affixing, masking or color-blocking device. 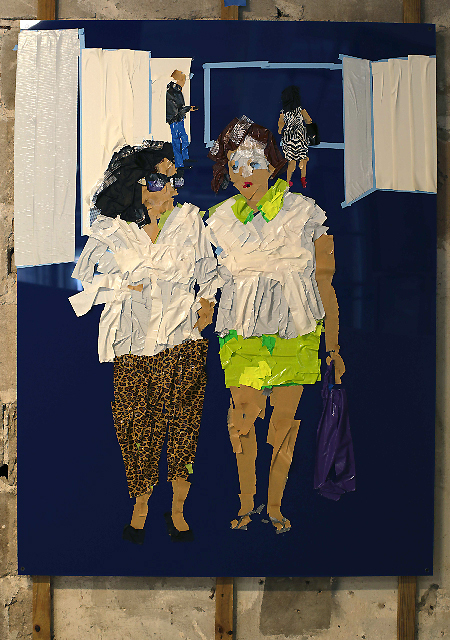 However, Tirtzah Bassel transforms this common material into an expressive tool, rendering form eloquently with duct tape as if she were painting. Each morning during Miami Basel 2013 fair week, Bassel would visit an art fair to study the people in attendance, while making mental notes and taking a few photos. 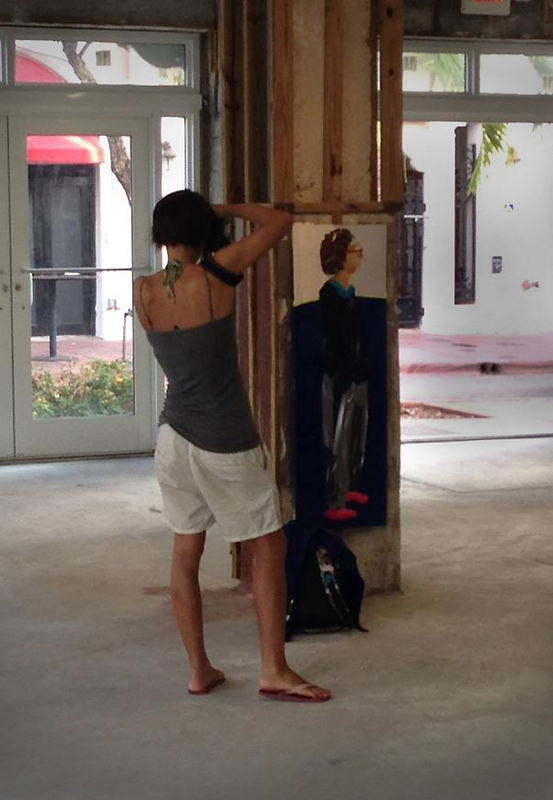 In the afternoon, she would return to her pop-up installation -- a raw, retail space on Española Way in South Beach. 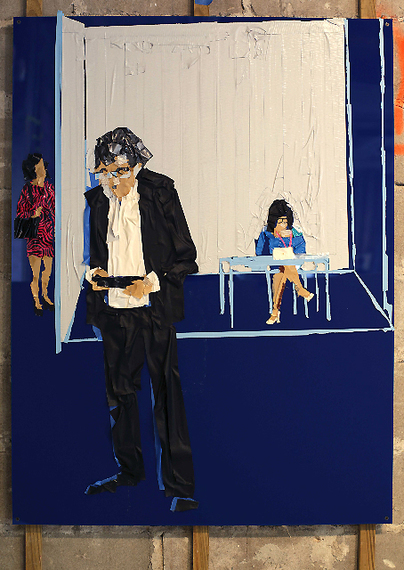 There, from memory, she would create portraits of art dealers, collectors and enthusiasts solely in duct tape on the cinder block, exposed brick and broken, sheet-rocked walls of her corner storefront. The exposed pipes and unfinished concrete columns of the space add a visual and experiential texture to Bassel's work and a challenge to creating them. A few works are on Plexiglas boards, but most are ephemerally attached to the articulated walls. Tirtzah Bassel portraits float on the brick and mortar in part because duct tape doesn't really stick to these materials. Also, the walls she worked on counteract that perceived space with surface texture despite the sense of space in the scale and perspective of her portraits and the art fair booths. The relief-texture and neutral tones of the wall surface are in stark contrast to the plastic folds of color-saturated tape, creating a visual conflict to the perspective depth of Bassel's forms and spatial lines. As duct tape is such a common material, Bassel's works are instantly accessible and equally impressive. Anyone who has handled duct tape knows how unwieldy it is, wrinkling and adhering to itself. A long piece of matte black duct tape that self-adheres along its vertical becomes the straight, loosely falling pant leg of an Armani-suited fair goer as he checks his phone. 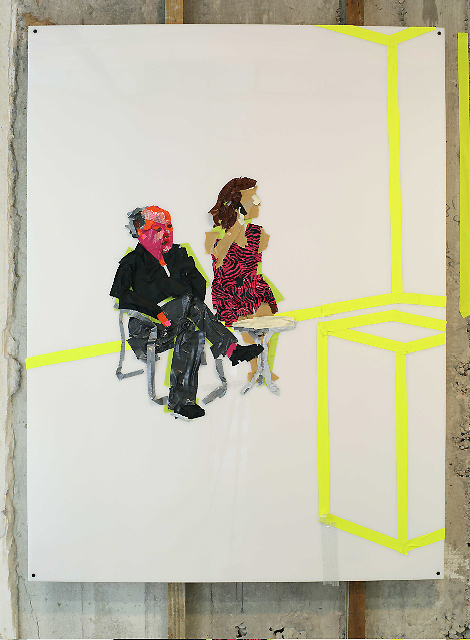 Her figures stand often indifferent to each other among neon-tape lines, delineating the art fair booths. Bassel deliberately omits the artworks that bring these people together. She works with the unruliness of the material to feature delicate distinctions and quiet moments that she observes in people brought together by art. Duct Tape Miami, sponsored by art collector and dealer Avi Gitler of Gitler & ___, breaths fresh life into the art fair concept. Removing social and financial barriers of an art fair means, it expands the possibilities for all the abandoned retails spaces across America and especially the dozens of empty art deco hotels along South Beach. Duct Tape Miami is a microcosm of Gitler's new art dealing venture. 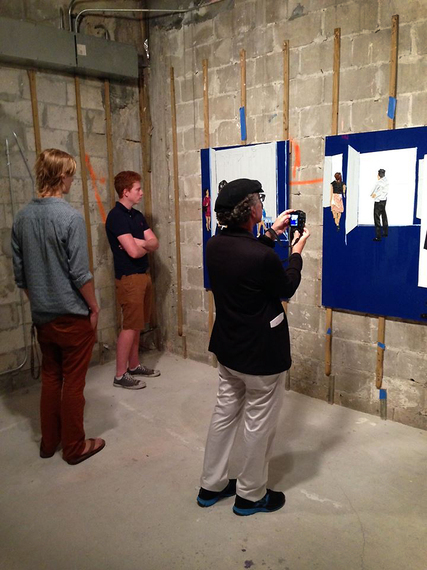 It's exciting to see a dealer thinking creatively about exhibition space and connecting people outside of the art world to art. Tirzah Bassel renders specific details in duct tape, working pesky folds into bodily form. She relays a passing moment of an individual's essence strikingly while also playing with social norms and adeptly weaving layers of society together. Buying a 2D work presented in an art installation like Bassel's adds an extra layer to its new home. The installation impression follows the artwork. One can imagine where it was on the wall in Miami, next to exposed brick and project the installed space in the mind around it. That experience in a specific time and place can be revisited with a glance to the wall.